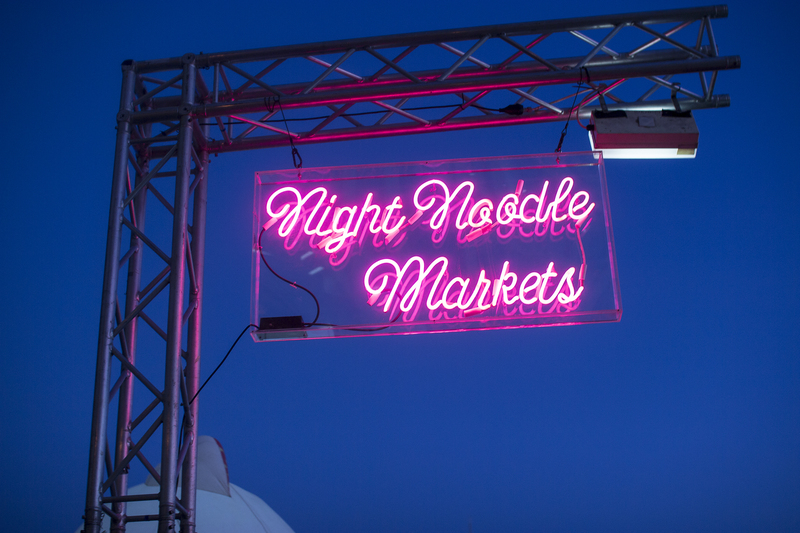 The Night Noodle Markets have arrived! 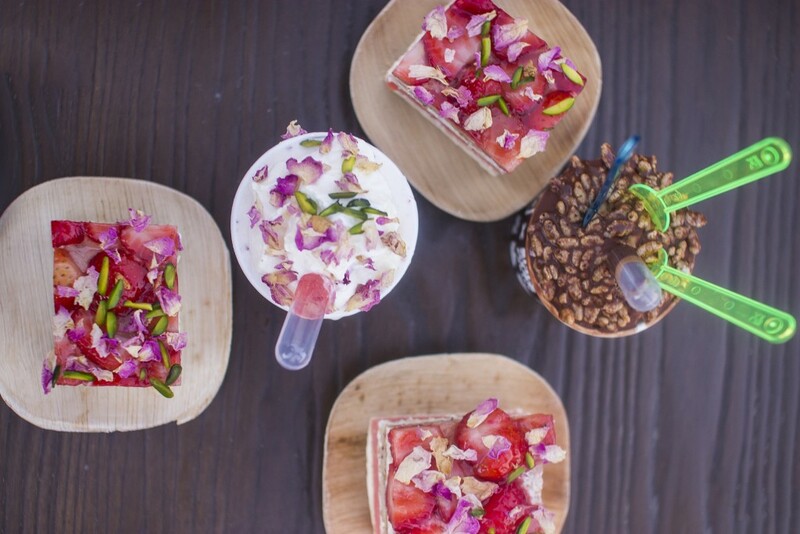 And to celebrate Good Food Month, they’ll be here from 30 March until 10 April serving up all kinds of Asian fusion and traditional fare to eager diners. In true blogger fashion I found myself front and centre at 5pm as the doors opened on Wednesday night, the first of twelve trading evenings along Elizabeth Quay. With Bryony from Perth Eats and Carly from Perth Munchkin by my side, we were ready to take on all of the delicious things… and of course we ate too much! 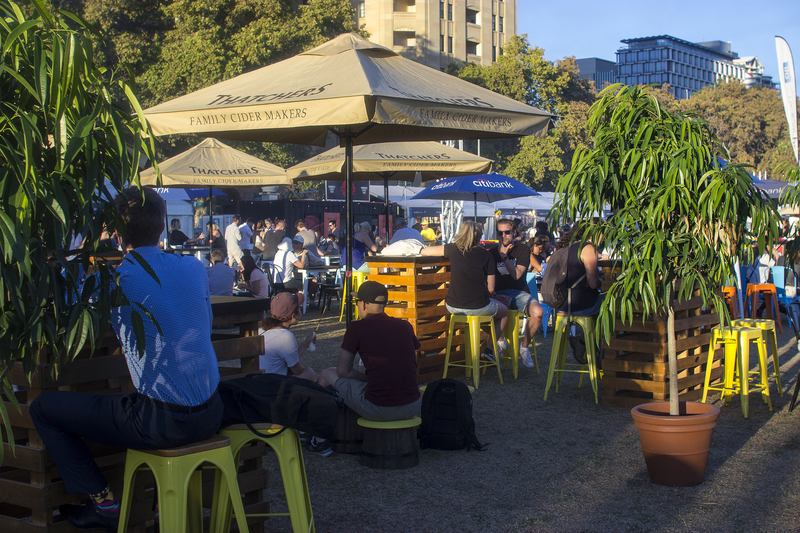 Last year during Eat Drink Perth, our lovely city was introduced to it’s first taste of the Night Noodle Markets and I was delighted to see that a change in venue from Perth Cultural Centre to our new gem location has really served it well. The layout is clean, the vendors lined up along the perimeter meaning any lines for food won’t be as confusing as the original. Lucky for me, getting in at 5pm I was able to skirt around having to wait long which made the experience even more fun – though I’m not opposed to lining up when the food is worthwhile. All around me were the smells and atmosphere of an Asian Hawkers market, with a cool (but surprisingly not gusty) breeze and great view of the river. 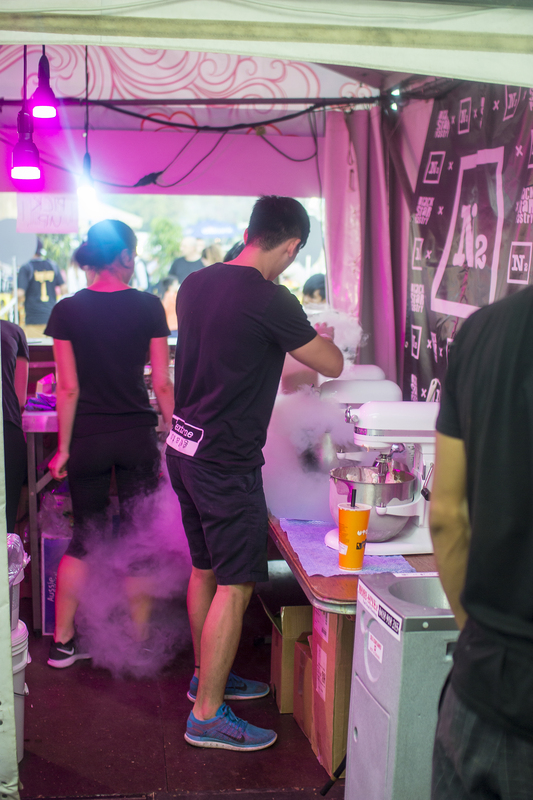 I had been invited down by the Night Noodle Mafia (part of me wishes they’d called themselves Ninjas so there’s a triple N happening there) to try Bao Stop, a Taiwanese street food stand – it’s almost like my mother’s homeland was calling out to me. Matty, the owner, was a friendly face that has the system down pat and mere minutes after placing our order, the food was steaming hot and in our hands to munch away. 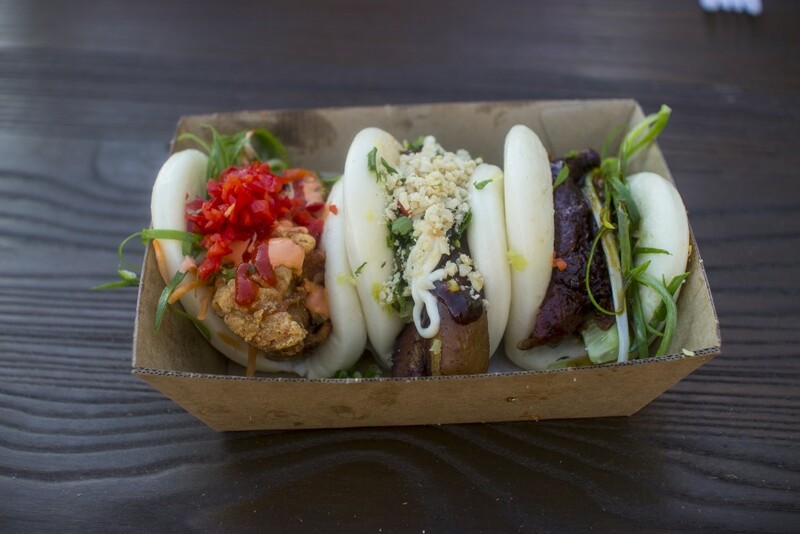 First up we tried the bao trifecta ($20.00). A three pack of steamed bao, there was a pork belly version, fried chicken and peking duck. Slightly more expensive than other bao versions around town (just) but these guys have brought their business here from over east, so I imagine there’s some exxy overheads they’re working with. 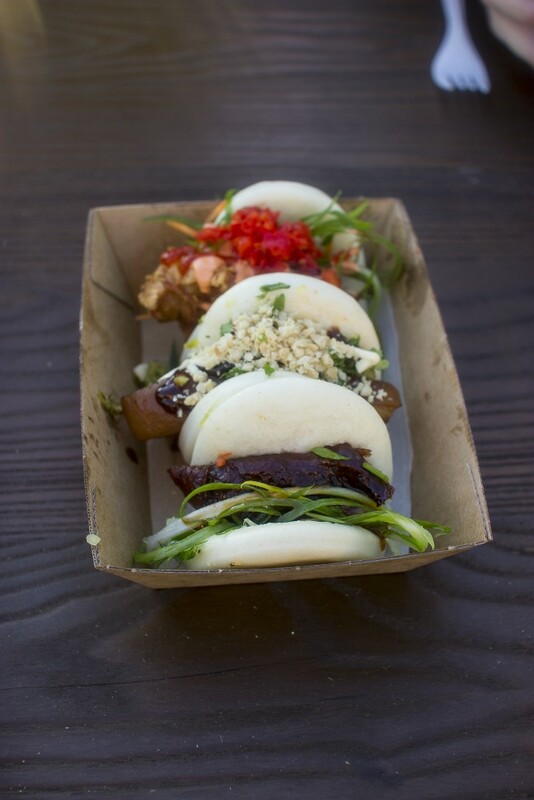 Now full disclosure… I am a hard critic when it comes to bao. My mum makes the OG of gwa bao – and I’ve grown up enjoying it from the moment I cut my first teeth, or so I’m told. Bao Stop’s pork belly was a really good rendition, so while it wasn’t the traditional flavours, it tasted delicious. Soft, unctuous meat that melted in my mouth, hoisin sauce, pickled mustard greens fresh coriander, Taiwanese mayonnaise and a good dusting of roasted peanuts. The trick to the peanuts is they need to be sweetened, which I’ve only ever experienced in Taiwan (or at mum’s) – but these ones were just plain. Tasty nonetheless, and played an important role in providing some crunch. The peking duck was an enjoyable flavour, though didn’t quite hit the high of the pork belly. 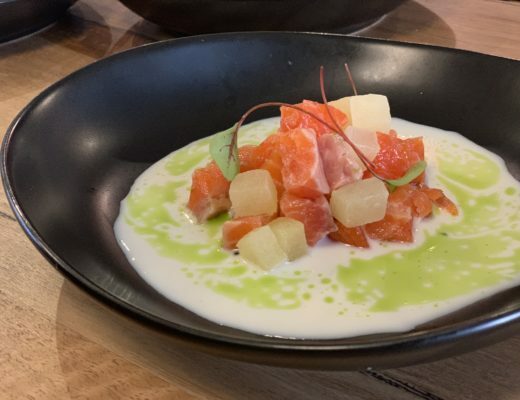 The duck skin had just the right amount of fat underneath (yum – yes, don’t even try to judge me) and was slightly crisp in places which ticks all the boxes for me with it’s crisp cucumber, spring onion and sauce. I would have liked more of the peking sauce on this as it did get a touch dry, but in all it was another good offering. The fried chicken was damn juicy! The chilli mayo had a fiery kick, which broke up the sweeter flavours of the other two baos in the box. 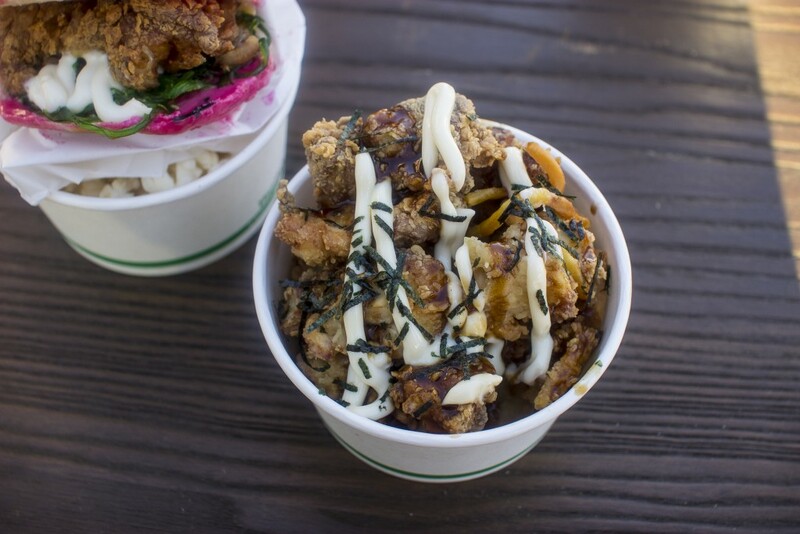 I mean who doesn’t love fried chicken… no one, that’s who. 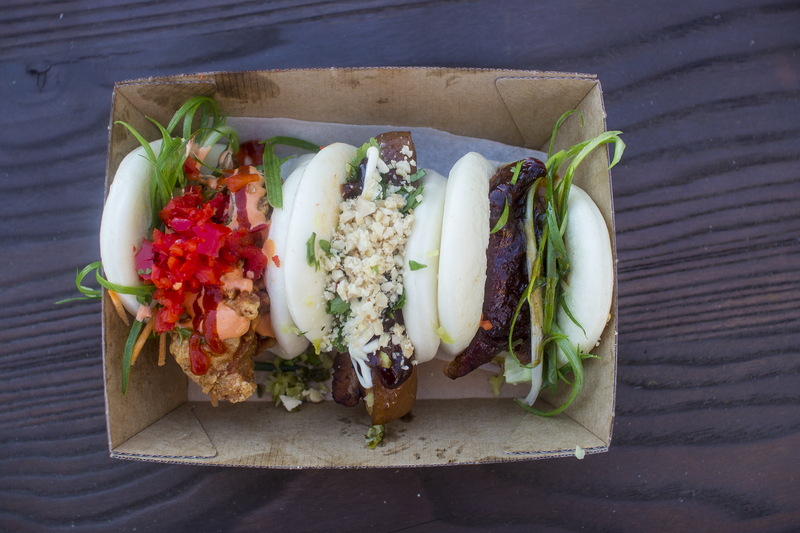 The other toppings of red sugar chilli jam, carrot and spring onion were a nice variation to your standard bao combos you tend to find. 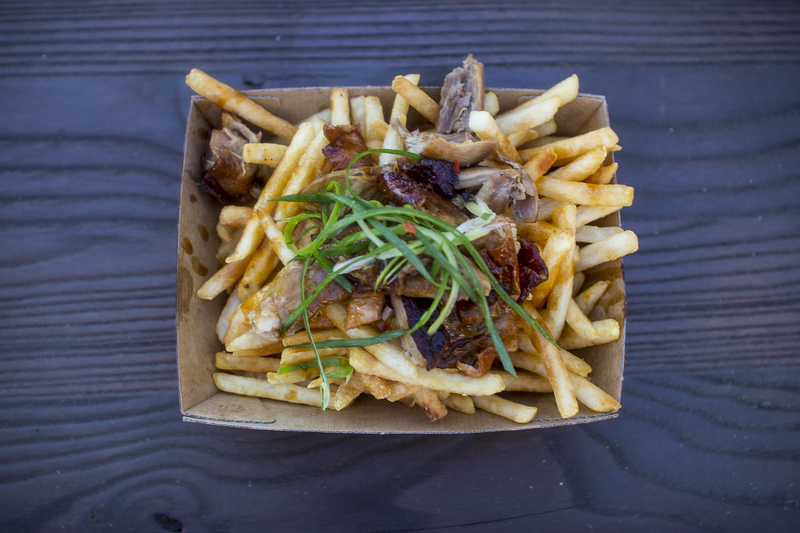 When I saw peking duck fries ($15.00) on the menu, there was no way in hell I wasn’t trying them. 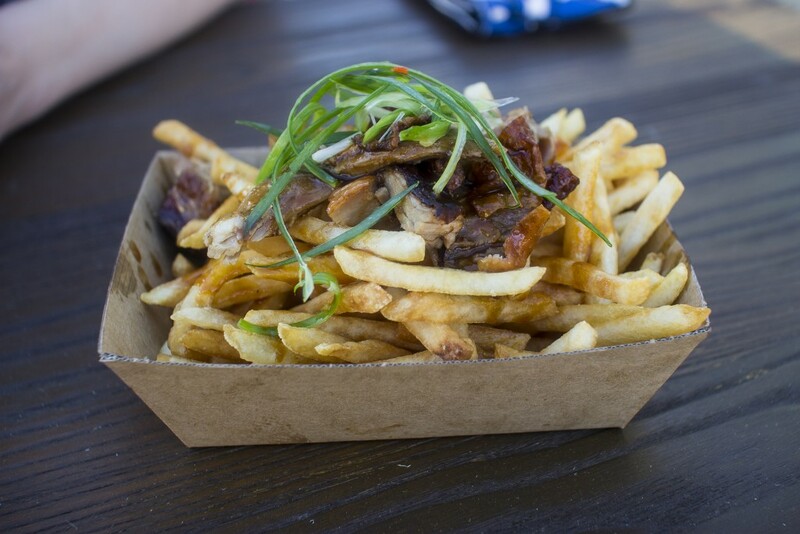 What I can only describe as elegant stoner food, these were super morish. Shoestring thin fries, well seasoned and a good heaping of duck with a light sauce and spring onions on top. I really enjoyed these – but they definitely needed more salt to elevate the flavours further. I also thought they were a bit more than what I would have expected, the serving size was generous and to be honest I think this dish alone could fill you up without the bao! 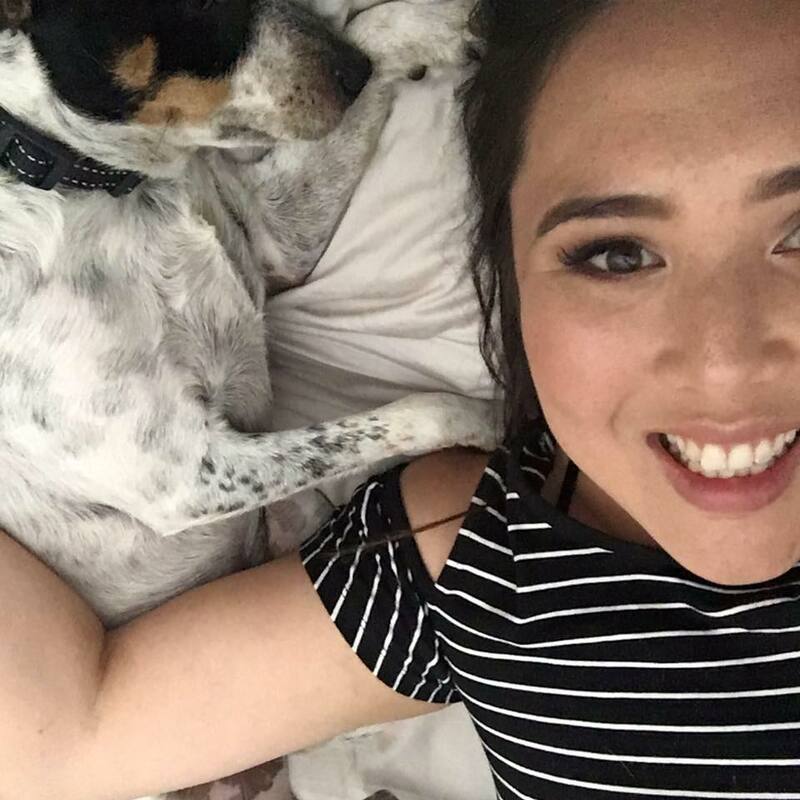 While that would have been enough for me, Bryony was actually also invited down to check out a few of the other venues, so it turned out my eating wasn’t over! 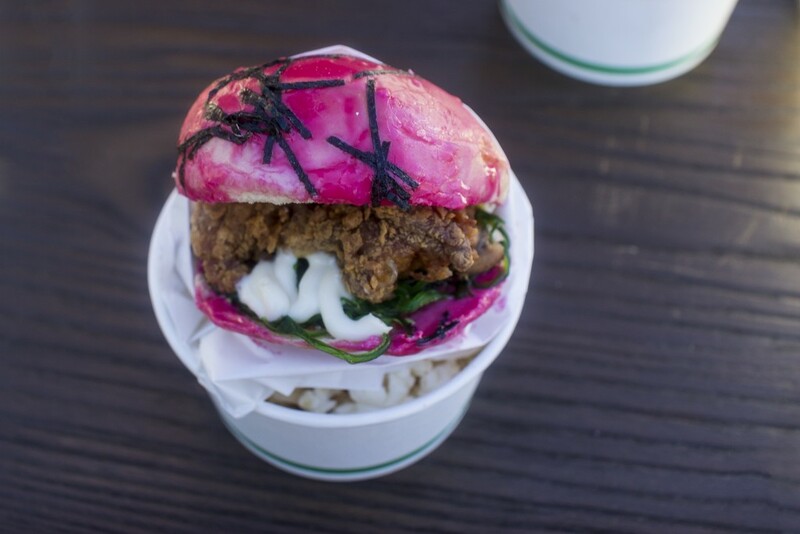 From Everybody Loves Ramen we tried the extremely photogenic sakura burger ($15.00) with ramen fried chicken, seaweed salad, kewpie mayo, curry sauce and of course the sticky sweet sakura glaze on half the bun. The chicken was succulent; the coating crisp. The matched regular sized serving of ramen fried chicken ($10.00) was just as satisfying and quite filling. I thought this was well priced considering just how much chicken there was! Oh and if you get the burger, you’ll find a little sneaky serve of miso buttered popcorn underneath which is a fun side rather than chips. 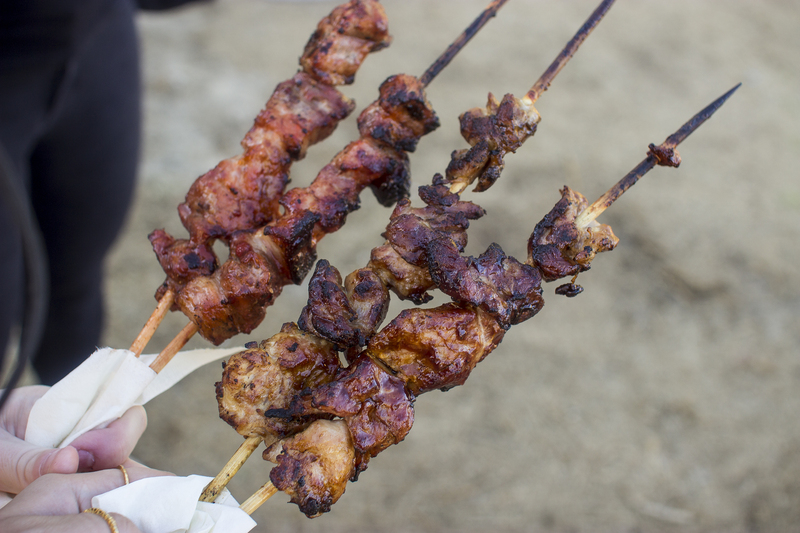 From Hoy Pinoy we tasted the inihaw na manok (2 skewers for $13.00) which is barbecue chicken in a traditional marinade and the inihaw na baboy (2 skewers for $13.00), a barbecue pork belly with a banana ketchup glaze. 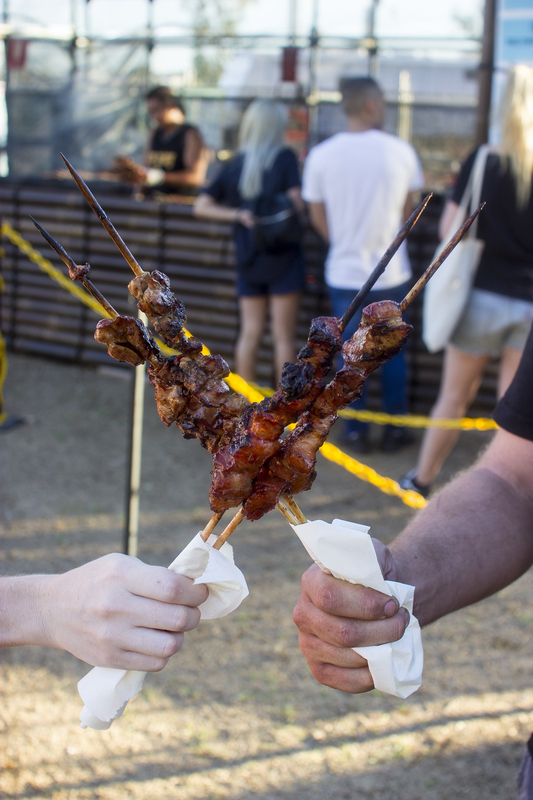 Last year at the Night Noodle Markets Hoy Pinoy was the star of the show, attracting punters waiting up to 2 hours to sample their goods. Finally having my turn to try them I thought that these Filipino meats were tasty but a touch dry. Bryony told me that last year they were much more juicy so we may have received ones that had just a touch too long on the grill since it was the start of service. I’d like to give them another go to see because they definitely had rave reviews in 2015. Our final stop was over to the N2 gelato and Black Star Pastry tent which I have to admit was the one I was most excited about. 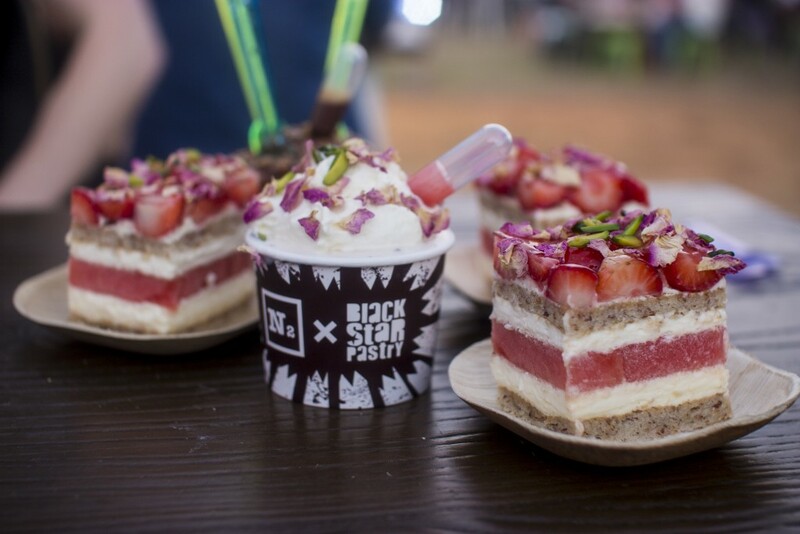 I’ve already tried N2 before, but Black Star’s cakes have a bit of a legendary status and I’ve been dying to try them for myself. 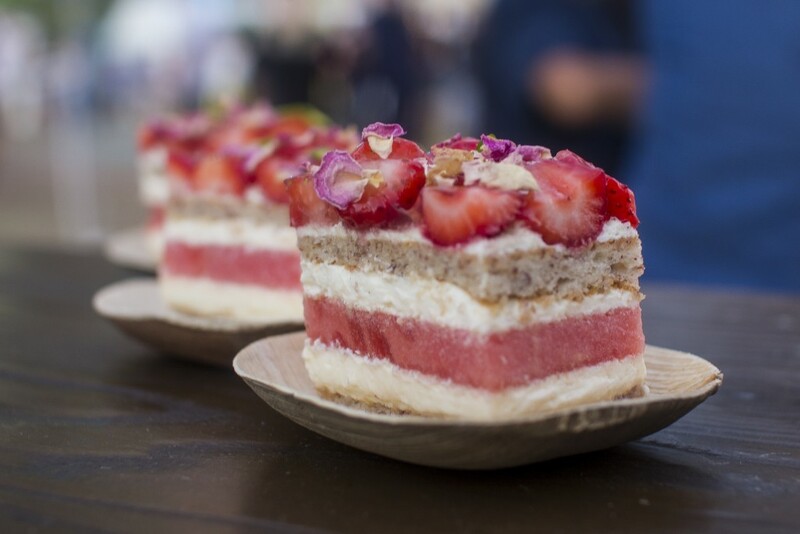 The real treat was getting a behind the scenes tour to see the GIANT slabs of their famed and popular strawberry watermelon cake before heading back to the front to try the three different desserts they’ll be selling during the markets. Just seeing the cake and smelling that fragrant rose scent made me extra excited that they’ve made the pilgrimage over from Sydney. My tastebuds and greedy belly thank you. There’s not really I can say about the cake ($9.00 for a slice) except… Oh. My. God. Honestly one of the best cakes I’ve had ever. 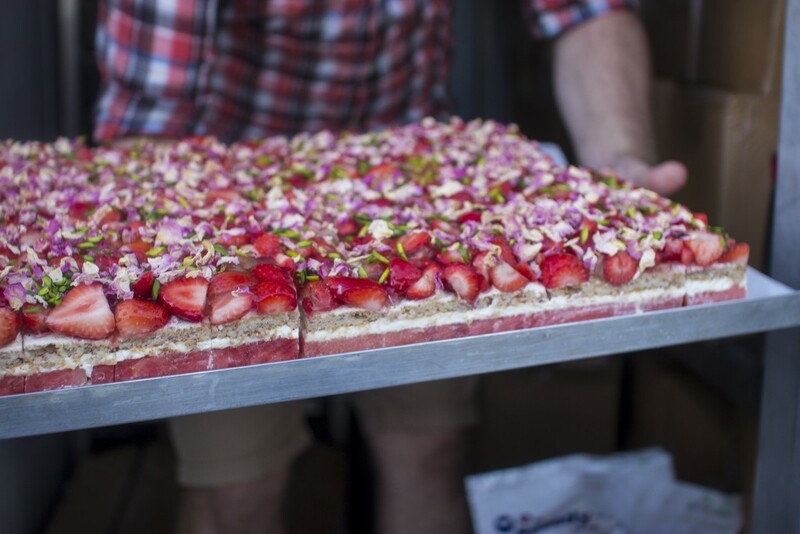 Ethereally light and not even close to being too sweet, it was an almond dacquoise, macerated watermelon, cream, strawberries, rose petals and pistachios. Well balanced, extremely flavoursome and so in sync it almost makes you want to cry. The cake smash gelato ($9.00) was equally satisfying but in a very different way. 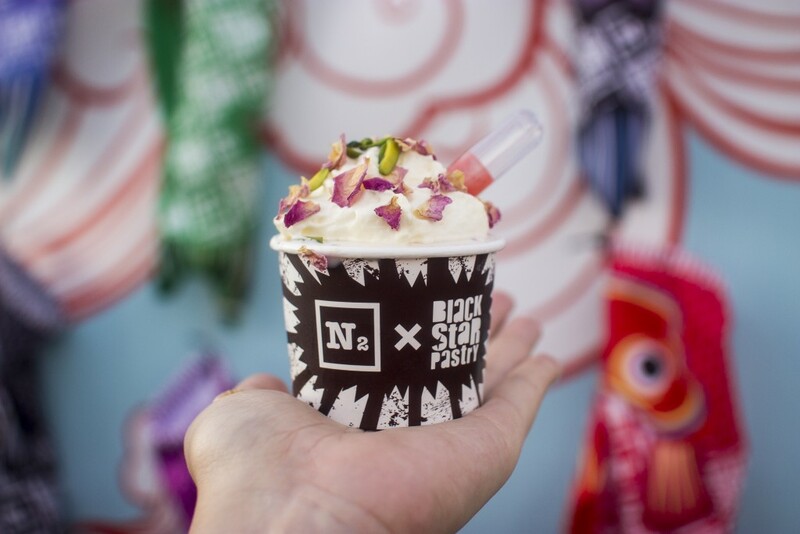 The rose is quite prominent in the creamy gelato but not overpowering which can be a risk with this flavour – it can end up a bit soapy if you’re not careful. 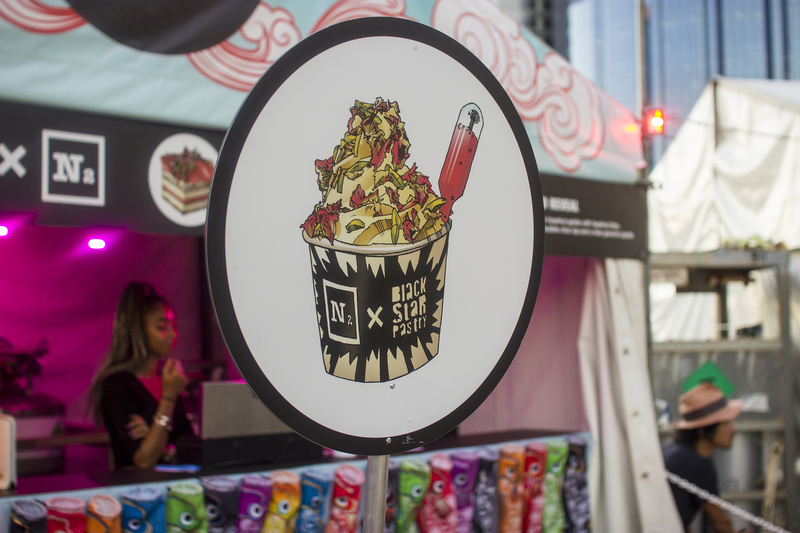 It was definitely reminiscent of the cake, but not quite the same flavour which made for a real treat as you could try both and not get sick (not that you would) of the taste. The ferraro bomb gelato ($9.00) is purely N2 and is a fun concoction for the chocolate lovers out there. Rich, creamy and with a nice crisp outer chocolate layer it lives up to it’s promised name. 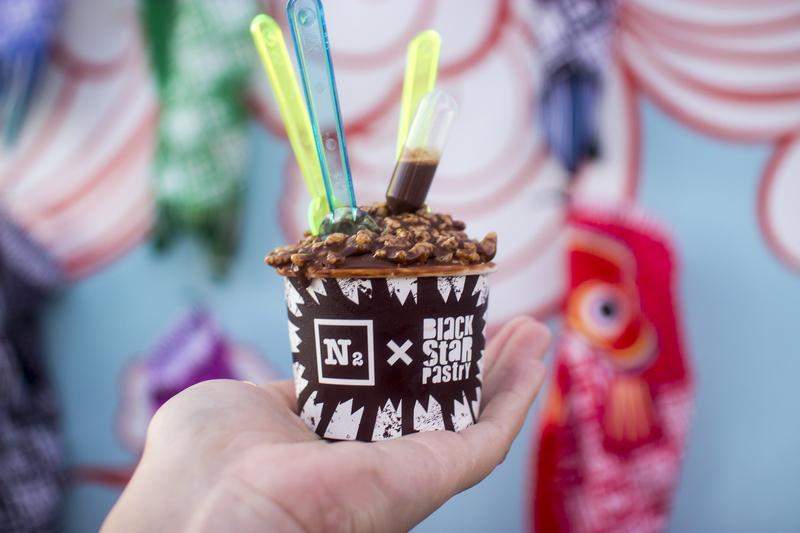 Some people suspect gelato made this way is more of a gimmick, but I thought the flavours here were delicious – and a great way to finish up my first experience at this year’s Night Noodle Market trying the eastern states additions. I’ll be back soon, and looking forward to visiting some of Perth’s local businesses taking part as well as some of the other newcomers who have come over for this annual festival. 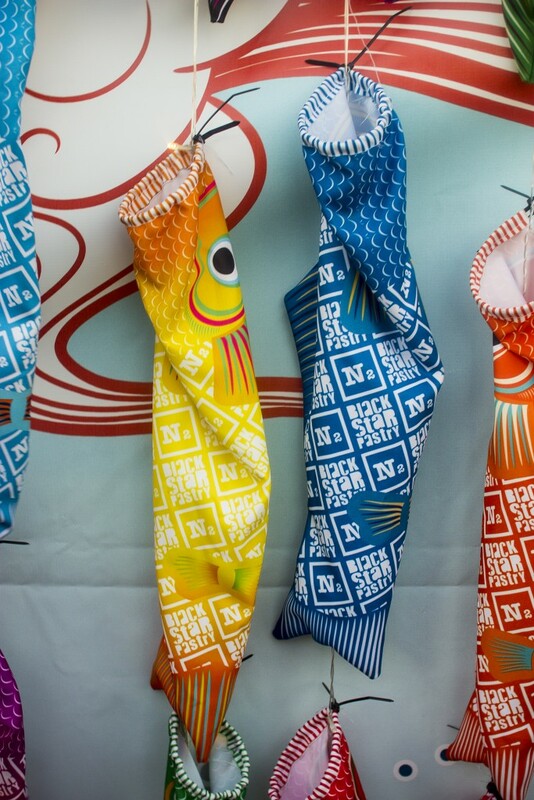 While you might not love crowds, the space and quantity of stalls this year is really well thought out and it’s good to see that it’s progressed beyond it’s inaugural event in Perth. 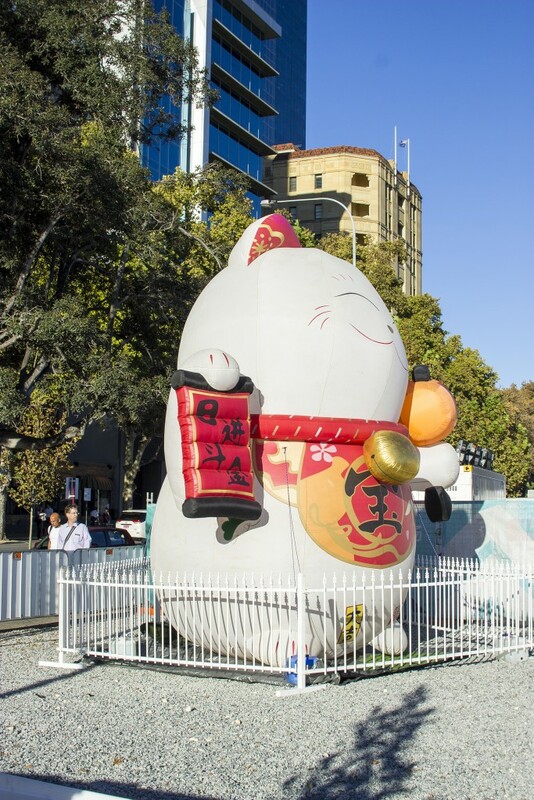 I can only imagine that it will continue getting bigger and bigger each year like it has in Sydney and Melbourne. 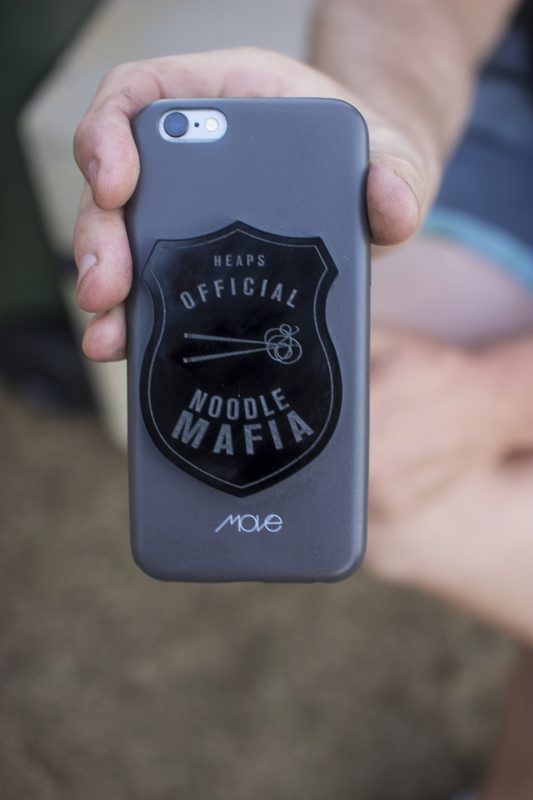 Big thanks to the Noodle Mafia for looking after us, and feeding us way more food than should be socially acceptable to eat in one sitting. 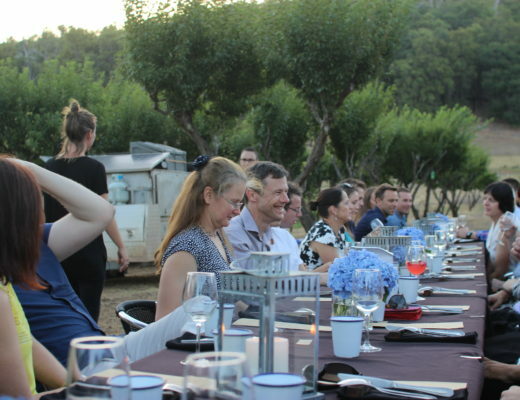 But hey, we’re bloggers, foodies and all round lovers of eating so we managed… and we loved it.